Kick off a night in Cancun at the Carlos'n Charlie's restaurant, where you enjoy a Mexican dinner, unlimited complimentary drinks, and waiters who dance and sing their way to your table. Afterward, head over to the Coco Bongo nightclub for a spectacular light show, acrobats, and live music. Cover bands perform hits from the Beatles, the Village People, LMFAO, and JLo, among others, as you dance and enjoy drinks at an open bar. Special Offer - Save up to 30% on attraction admissions by booking this package with us! - Book Now! Dive into Cancun's famed nightlife during this after-dark tour of three of the city's top clubs. Get skip-the-line entry to clubs like Se'or Frogs, La Vaquita, and Mandala. Breeze past waiting crowds like a VIP and enjoy 6.5 hours of dancing and unlimited drinks from the open bar. You'll be in the company of a tour guide/host during the experience. Plunge headfirst into Cancun's legendary nightlife with this skip-the-line entry to Mandala Beach Club, including unlimited drinks. Dress to impress in your best swimsuit and enjoy VIP status as you bypass the crowds waiting to get into the glamorous beach club that's best known for its weekly pool parties. Dance to a live DJ, take a dip in the pool, and soak in the hot tub as you enjoy plenty of drinks from the open bar until the wee hours. Get the party started as you hit the resorts' most popular bars, skip the line outside and enjoy unlimited local drinks in every venue. Meet your party team in front of Daddy O' and sample the bustling nightlife as your guide takes you on a bar crawl for over 6-hours. Explore four party'atmospheres, four ways to have fun, and four places, in just one fun night while meeting other holidaymakers. All your local drinks are included and open bar wristbands are valid until 3:30am in the last spot visited. This is the perfect way to spend the night in Cancun. All you need is attitude and a great pair of shoes. Experience Cancun's legendary nightlife with this skip-the-line entry to Dady'O nightclub, including unlimited drinks. Dress to impress and enjoy VIP status as you bypass the crowds waiting to get into the glamorous club. Dance to live DJ sets as you groove along to the light, sound, and laser effects. Enjoy plenty of drinks from the open bar until 3:30am ' they're included along with your entrance fee. There's no other place like The City Nightclub! 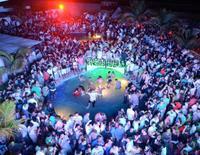 Enjoy a full night of open bar at one of the hottest places in Cancun and get treated like a VIP. Book your open bar ticket in advance and skip the lines, chill out in the preferential area and dance the night away. You just can't miss it! At Se'or Frog's you will forget boredom and will have the time of your life at this party full of colors. Join in the fun for this Glow party which includes open bar, one dinner item and skip-the-line access. Get skip-the-line entry to the famed'Palazzo'Cancun'nightclub, plus'unlimited drinks from the open bar, with this nightlife experience package. Dress to impress, and enjoy VIP status at one of the biggest parties in town as you bypass the long lines'waiting to get into the club. Get inside'access to the club's preferential VIP areas, and watch performers on stage as you dance the night away. Spend a night in Cancun at three of the city's most exciting nightclubs! This 6-hour club-hopping tour is filled with fun, dancing and VIP service. Enjoy unlimited drinks while you dance the night away, and skip the long entrance lines at each club. This is the best way to experience a night out in Cancun. Experience Cancun's famed'nightlife with this skip-the-line entry to the glamorous Mandala Cancun'nightclub, including unlimited drinks. Dress to impress and enjoy VIP status as you bypass the crowds waiting to get into the multi-level'club. Listen'to live DJ sets as you move'along to the light, sound, and laser effects. Enjoy plenty of drinks from the open bar until 3:30am, they're included with your entry fee.